Since 1998 Trade Fabrication Systems Ltd has been the UK’s leading processor of BBA approved peel clean protective films for floor panels, Class 0 foil faced boards and factory applied coatings for a variety of applications. Our initial focus was primarily the construction industry were we identified specific problems and issues related to our unpredictable climate and safety. The ever increasing demand on efficiency together with tighter building regulations and HSE requirements means house builders in particular are constantly seeking solutions that are simple, cost effective and conform to current legislation. This lead to the development of Peel Clean films to provide temporary weather and damage resistance to particleboard flooring, whilst being used as a safe working platform during the build process. Our enviable reputation has been built over the years by working closely with customers to effectively combine innovation with unbeatable service enabling us to offer products suitable for use in a wide range of industries. Based in Woolston, Warrington, adjacent to Junction 21 of the M6, employing a highly dedicated workforce and utilising the latest manufacturing processes, TFS offer a diverse range of products and services which are at the forefront of customer expectation and requirements. Factory finished quality products that provide a combination of performance, economy, speed and efficiency. TF’s experienced and dedicated technical support team thoroughly understand customers’ needs, have unrivalled product knowledge and being constantly in tune with the latest industry developments, actively contribute to a continuing company development programme. With innovation and continuous improvement at the heart of its business performance, TFS aims to create cost effective solutions by offering a range of specialised products supported by unrivalled customer service. We offer expert advice on all our products and can provide full technical details to assist in the specification of cost effective solutions. 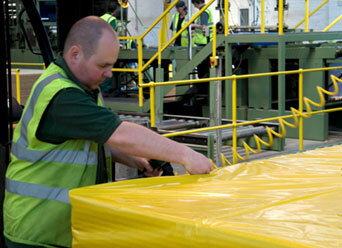 With an extensive warehousing capability we can provide total supply flexibility. Our manufacturing process, using the latest technology and systems ensures consistent quality to exacting standards is met time after time. TFS has an experienced and dedicated support team with the flexibility to respond positively to all your needs. In addition to existing innovative products we are constantly developing new ideas and providing solutions to satisfy the needs of a diverse range of industries. TFS Ltd recognise their duty to customers, staff and suppliers to maintain the highest standard of regard to the environment through the responsible procurement and utilisation of products within our processes. The company ensures that this policy is communicated to all stakeholders within the business. TFS are committed to complying with all legal requirements with regard to procurement and utilisation of products used. Our customer base consists of the world’s major wood products manufacturers and UK distributors who all seek to comply with international environmental legislation. Ensure the sustainable use of natural resources through optimisation including saving, reducing, re-using and recycling. Ensuring compliance with legislative requirements in relation to all environmental issues. Seek continual improvements in safety, hygiene and health in the workplace. Commitment to the minimisation of the impact of its processes on the environment.